The warm summer of 1885 encouraged Mr. Moon and his friends to place a springboard at Blackrock where there is a tidal range of 17’3”. This did not please the landlord Col. O’Hara who made life difficult for the bathers, often denying them access to the bathing area. In 1909 he took six defendants to court for trying to create a right of way but eventually some form of reconciliation was arrived at the following year between O’Hara and the Urban Council where he would “Grant to the Galway Urban Council a lease of the premises known as “The Black Rock”, with a right of way on foot over the path leading to such, at an annual rate of £1, the place being used for bathing purposes by the public”. The formal opening was performed by Josie Owens, the Mayor of Galway in 1954 and the tower was blessed by Fr. Hyland, parish priest of Salthill. “It was graceful and practical in design and had the staunchness which our Western seaboard requires. It was the finest diving tower in the country”. The construction work was done by Salthill Company, James Stewart & Co. They occasionally lost hammers and chisels in the water so they employed local champion swimmer Ollie Powell to dive in and retrieve them. 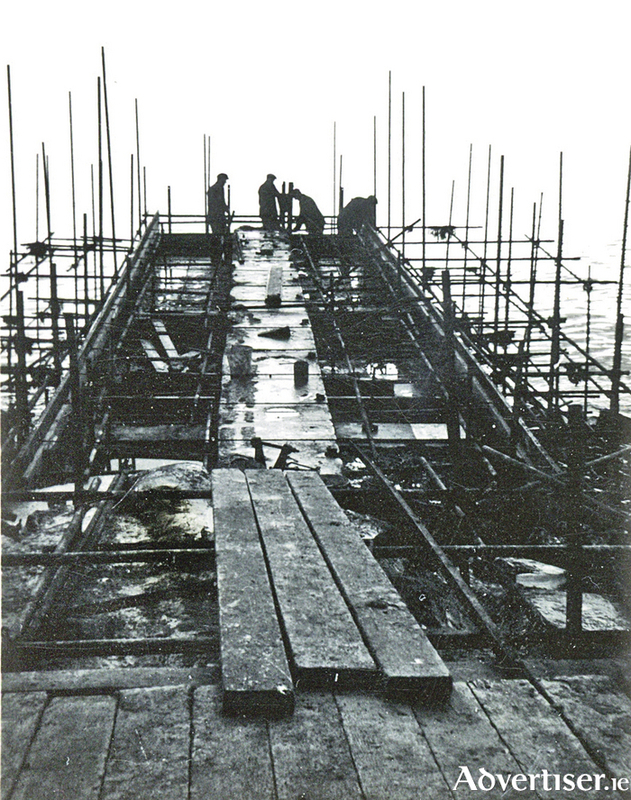 Our photograph shows the tower under construction. The Tower has since become a Galway icon, one of the most recognisable structures in the west of Ireland, dear to the hearts of many, especially swimmers. Just listen to the level of complaints when it is overdue for painting. It is used all the year around, and attracts thousands of people during the summer months. Now it is about to undergo a revamp, some of which is necessary and long overdue because of old age and so much usage and also for health and safety reasons, and is therefore to be welcomed. However, a proposal to place a system of railings on the foreshore between the dressing area and the tower seems completely over the top (pardon the pun ) and would destroy the character of the area. What about the idea of spending the money on the “pools” and the pier at the ‘Ladies Beach’ instead. They are in bad shape and in more urgent need of health and safety measures than a series of railings on the foreshore at Blackrock. The Galway City Museum series of lectures continues next Saturday next at 2.30pm when Ultan Lally will give an illustrated talk on “The Dominicans in Galway”. All are welcome but it is advisable to book by calling the museum at 091 532 460.